Unarguably, food is one of the most important parts of our lives as it is the substance which gives us nutritional support, thereby, helping us lead a prosperous and healthy life. But if you think food is only confined to this section, then you are certainly wrong. Food is something which also carries with it the culture and lifestyle of a place. Therefore, it is said that if you want to explore the lifestyle of any town or city, it is advisable to take a tour of its food streets. 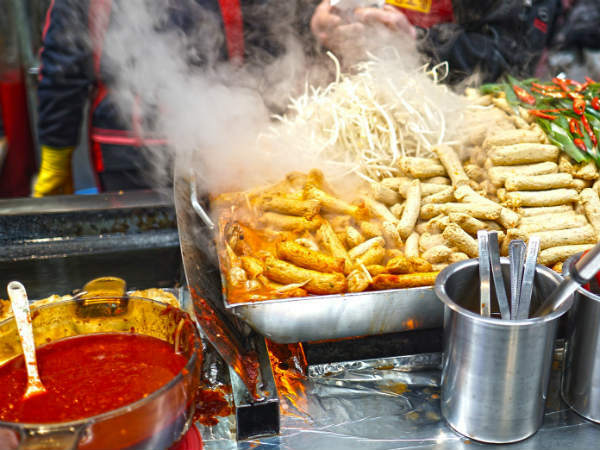 And if you are a foodie, then this expedition of exploring food streets becomes genuinely fun. Following are the major places in India that are known for serving the best street food. Wouldn't you love to savour their delicacies? If yes, then read on to know more about these places and their appetising cuisine. If there is any place in India which is immensely popular all over the world for its luscious cuisine, then it is assuredly Hyderabad. Do we really need to tell you about the unearthly taste of Hyderabadi biryani? But if you think this Charminar city is limited to biryani, then you really need to plan a tour of its food streets where you can savour the perfect mix of Mughlai and Turkish cuisines. Apart from biryani, you can also enjoy Irani tea, keema samosa, haleem and phirni. So, how about relishing these exquisite tastes in the food streets of Hyderabad and exploring your taste buds? The city of Nawabs, Lucknow is all one needs to delve deep down the delectable layers of a piquant cuisine? Served with quintessential etiquette, the street food of Lucknow is all set to steal your heart with its succulent and yummy taste. Famous for its tunde ke kabab, this historic city has a lot to offer its visitors. If you are looking for a destination where you can enjoy a perfect amalgamation of Nawabi and Awadhi cuisines, then Lucknow is your calling. Apart from tunde ke kabab, you can also relish the flavour of koramas, sheermal, katori chaat, kulfi and malai makhan. What else would you need to satisfy your hunger? Indore on this list of Indian places with the best street food surprises you? But why should it? After all, it is one of the few places in North India where you can enjoy the best of chaats. If you are a vegetarian and are looking for an ultimate place to satisfy your hunger, then there cannot be a better place than Indore for you. From enticing Indori chaats to lip-smacking aloo tikkis and tangy kachoris to soft puris, there are hundreds of dishes which can send you to the valleys of contentment. An ultimate destination in India where you can appease your hunger at the cheapest rate, Kolkata is the home of food streets. If you think Kolkata is meant to provide you only with rice and fish, then explore the lanes of Park Street and New Market where hundreds of alluring dishes await the arrival of a foodie. The major street foods which can be savoured here include ghugni chaat, jhalmuri, telebhaja and singhara. If you are a chai lover, then the food streets of Kolkata will certainly surprise you, as you can avail the opportunity of savouring kullad tea here at just 5 INR. Isn't it amazing? A plate of crispy palatable dosa with moreish coconut chutney, what a combo! Irrespective of what we prefer to eat, we all love dosa to the core. It is probably one of the most popular Indian dishes which have gained recognition all over the world. So, if you desire to try an ideal dosa, the food streets of Chennai are the best places where you can enjoy them to the fullest. Apart from dosa, you can also try idly, uttapam, pongal, paniyaram, vada and poori. Mumbai is a city of dreams not only for those who aspire to achieve success in life but also for those who always think of appeasing their hunger. We all know Mumbai's favourite and most famous street food is vada pav. But have you ever tried exploring beyond conventions? Apart from vada pav, you can also get the best of bhelpuri, pav bhaji and misal pav in the food streets of Mumbai.